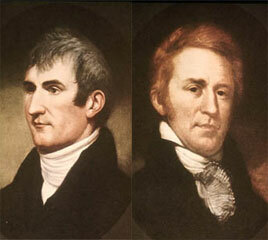 The two-year expedition of Meriwether Lewis and William Clark from the Mississippi River to the Pacific Ocean and back got under way in May 1804 in Missouri, then the western edge of the United States, and ended when the Corps of Discovery, as President Thomas Jefferson named it, returned to St. Louis in September 1806. The explorers gathered new information about the West, its people, animals, geography, vegetation, rivers and lakes. The explorers described in detail the Missouri and Columbia rivers, the Indians who lived along their shores, and, in the Columbia drainage, abundant salmon. Officially, so as not to offend Spain, whose possessions were to the southwest of the Missouri River, or Great Britain, whose possessions were to the north of it, the expedition was a scientific and literary expedition, despite the fact that Lewis and Clark were U.S. Army officers and most of their 43 men were soldiers. The true purposes, however, were commercial and political. Jefferson, who conceived the expedition, sought to beat Great Britain to the western fur trade by finding a water route across the continent to the Pacific Ocean. Publicly, Jefferson’s intent for the cross-country exploration was to enhance geographic knowledge of the West. Privately he aimed to expand the United States and wrest the fur trade from the British. In his January 1803 request to Congress for $2,500 to finance the expedition, he couched his intent in terms of promoting commerce, which was within the powers granted Congress in the Constitution. He wrote that the Indians of the Missouri River drainage supplied furs “to the trade of another nation” — an obvious reference to Great Britain — and that the United States would do well to know these tribes better. He theorized that the Missouri might provide a better transportation route to the Pacific for this commerce. The Columbia, as Lewis and Clark discovered, is not a principal stream of the Missouri. That did not matter. The goal was not the headwaters of the Missouri but the Pacific Ocean. Historian Bernard DeVoto wrote that Jefferson already had decided to send an exploratory mission west across then-Spanish Louisiana when he took office in 1801. To the expansionist Jefferson, the exploration would knit together the eastern and western ends of the American continent, if tenuously. The Columbia River, virtually unknown in 1804. Robert Gray had discovered it only 12 years earlier. Jefferson imagined that the portage between the headwaters of the Missouri River, which drained east to the Mississippi, and the headwaters of the Columbia, which drained west to the Pacific, would be only a short distance, easily portaged by fur caravans. In fact, as Lewis and Clark discovered, it is not a short portage and it is not at all easy. “I took two men in a Small canoe and ascended the Columbia river 10 miles [from the confluence with the Snake River] to an Island near the Stard. [starboard: right, or north side, in this case] Shore on which two large Mat Lodges of Indians were drying Salmon. The number of dead Salmon on the Shores & floating in the river is incredible to say — and at this Season they have only to collect the fish Split them open and dry them on the Scaffolds of which they have great numbers. As Clark and his party returned downriver they passed more villages and noted “great numbers of Dead Salmon on the Shores and floating in the water, great numbers of Indians on the banks viewing me. . .” At one village, the party stopped and entered a lodge constructed of rush mats. It was “crouded with men and women and children.” The Indians boiled salmon for their guests in baskets of water, into which they had placed rocks heated in a fire. The boiled fish, Clark noted, “was delicious.” The Indians also gave the explorers gifts of several fish. Typically, the baskets were stacked together in groups of 12, seven on the bottom and five on top. Each basket was about two feet long and one foot in diameter. Salmon, dried and pounded flat, were pressed into the baskets, which were lined with stretched and dried salmon skins on three sides. When a basket was full, it was covered with stretched salmon skins, and these were tightly secured. The baskets then were stacked in a dry place and covered with grass mats. Lewis and Clark counted 107 of these stacks at The Dalles weighing, in total, an estimated 50 tons. It is a tribute to the skill of the boatmen that they were able to maneuver through the rapids and emerge safely below. The Indians, Clark noted, were astonished by the feat. The expedition was fortunate to reach this place in the late fall. In the spring, during the annual freshet, the water route likely would have been impossible. Lewis assumed the pounded, dried fish was bartered primarily to European fur traders. He wrote: . .still I must confess that I cannot imagine what the white merchant’s object can be in purchasing this fish, or where they dispose of it. Lewis surmised that the Celilo fishers obtained the European trade goods from coastal tribes, who had received them in trade with European fur traders. He assumed that the coastal tribes then consumed some of the dried fish themselves and traded the remainder to other coastal tribes in exchange for the trade goods. This scenario was confirmed for him by Indians who visited on January 20th, and Lewis noted the fact in the journal: “The Indians who visited us today understood us sufficiently to inform us that the whites did not barter for the pounded fish; that it was purchased and consumed by the Clatsops, Chinnooks, Cathlahmahs and Skillutes.” The trading among Indian groups, the location and the broad, deep river convinced Lewis and Clark that the mouth of the river would be a good place for a trading post to service the cross-country and cross-ocean trade that Jefferson envisioned. The explorers hoped they might encounter a trading ship in the Columbia estuary so they could send some of their accumulated materials home and acquire a supply of trade goods for the return journey. But no ship arrived, and the party abandoned Fort Clatsop on March 23, 1806. A month or so later, a Russian trading ship tried unsuccessfully to cross the Columbia bar. On board was Nicolai Rezanov, co-founder of the Russian-American Company, a fur-trading enterprise based at Sitka. Rezanov envisioned a Russian settlement at the mouth of the river, but it never came to pass. At the time Rezanov’s ship waited in vane for calm conditions on the bar, Lewis and Clark were near the confluence of the Willamette and Columbia Rivers on their eastward return journey about 80 miles upriver. Rezanov sailed on to California. Lewis and Clark. Photo: Wikipedia.